Can you trust the Liberals who had four years to do something and all they did was ban some Aus-made rifles and increase red tape on storage? We’ve reported extensively (here, here, here) about Rene Hidding’s defence of the Tasmania Police decision to ban a bolt-operated, Australian-made rifle because they didn’t like the way it looked. The failure of the Tasmania Police to offer cogent reasons for the ban is a disgrace. 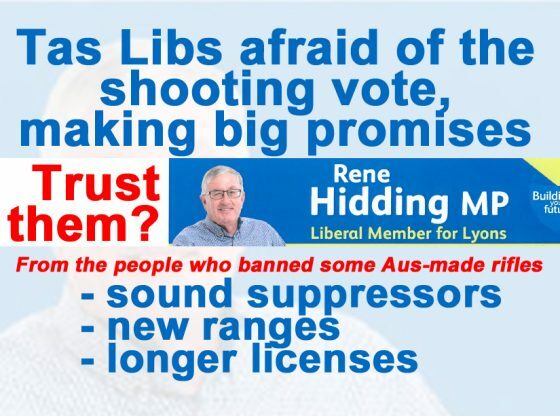 If Rene can’t even get the Tasmania Police to fulfil their basic duty to give some reasons for a decision that impact thousands of people, why would they be able to walk on water and bring suppressors into common use by farmers? Is RSPCA Qld trying to use its Animal Care powers to ban hunting?